Robin Hood’s Bay (or ‘The Bay’ as the locals call it) really is a little gem of a place. Though it attracts many visitors and gets very busy don’t let this deter you. The first thing to note is that you can’t drive down to the village – well you can but there’s nowhere to park so you’re left performing an awkward about-turn and returning to the car parks at the head of the village. In any case the walk down is one to be savoured, with its nooks and crannies and haphazardly built small cottages sitting on yards and narrow walkways to explore. The village survives part of it being swept into the North Sea in the past and a sea defence wall was finally built in the 1970’s.The hugely steep hill down into the village takes one directly to the beach where a very welcoming pub named The Bay Hotel sits. From here views can be had over the North Sea whilst taking a pint or bite to eat. Very popular is the small yard outside too. The last time I was there a travelling family of folkies who were performing at the Whitby Folk Festival were giving an impromptu performance in the yard whilst their children danced to the music. It was a beautiful sunny afternoon and truly one of those moments you wish could last forever. I’ve been blessed to be in this part of the country on many an occasion and always enjoyed the variety of rugged scenery, interesting coastline and attractive villages in the area. For those with an interest in walking may I at this point recommend the following website extolling the virtues of the wonderful Cleveland Way, a 109 mile long national trail which in part, hugs the coastline of this county. Although I concentrate primarily on the outdoor aspects of North Yorkshire there is something for all in this part of the world and on that note I’ll begin with one of the area’s busiest resorts, Whitby. Whitby has always seemed a town of two parts to me. There is undoubtedly the ‘fish and chip, amusement arcades and ice cream’ area but there is much history here worthy of digging up too. Noted as the home of Captain Cook, the house he lived in as a young man can be visited for a small charge. Additionally its very worthwhile taking a stride up the ‘199 Steps’ (count ‘em) to the prominent Whitby Abbey overlooking the town. The town also has decent safe beaches for the kids to gambol on whilst there are plenty of pubs and amusements for mum and dad at night. A time of year to watch out for is the Whitby Folk Festival which even for those who are not fans makes the place come to life with live music in the pubs during August. The busy harbour is good to stroll and offers the largest car park nearby. Beware though because sometimes parking can be a real problem in this town. I have personally enjoyed my times staying just outside the Whitby, taking a bit more life in within the town on an evening. Bay and these two villages are in many ways similar though much less commercialised or well known. They are both ancient fishing villages and extremely attractive for that. Each has a huge steep access road down to the villages which sit by the water. They both feature higgledy-piggledy tiny cottages crammed in together in a random fashion and are a joy to explore.The great thing about these two places is that they make a very pleasant walk between them along the cliff tops, adhering to The Cleveland Way. The distance between them is around 2.5 miles and takes perhaps an hour. A lovely thing to do is stroll between them and take in magnificent views over the North Sea. Runswick Bay, (pronounced Runzick Bay) has a quaint pub and a café whilst Staithes has a beauty of a pub which sits right by the water named The Cod and Lobster. Do yourself a favour if you find yourself in this part of the world and pop inside for a pint of Yorkshire ale and sit outside and peruse the waves. I’ve sat for hours doing this and never wanted to move from that spot. 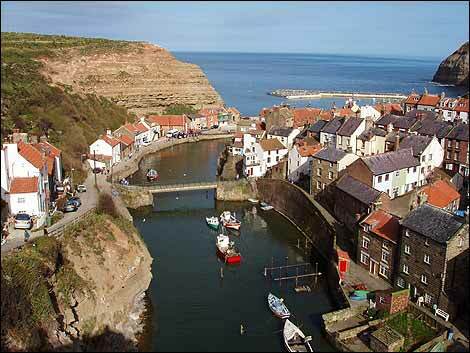 Staithes also offers a large segment of Captain Cooke’s story as he lived and worked here as a young man. Additionally the lovely harbour in the village is much photographed for calendars etc. The views always show the local ancient round-bottomed fishing boats called cobles which are unique to this beautiful area.